As an experienced old VPN user myself — I wanted to introduce a super easy method for friends and relatives, suitable for any total beginner or those who just like convenience. Security is so important that everyone should use VPNs. So here it is, step-by-step VPN instructions below! Ordinary VPN is shared with other users. This can be a problem when logging into social media websites (Facebook, Google, LinkedIn, etc.). 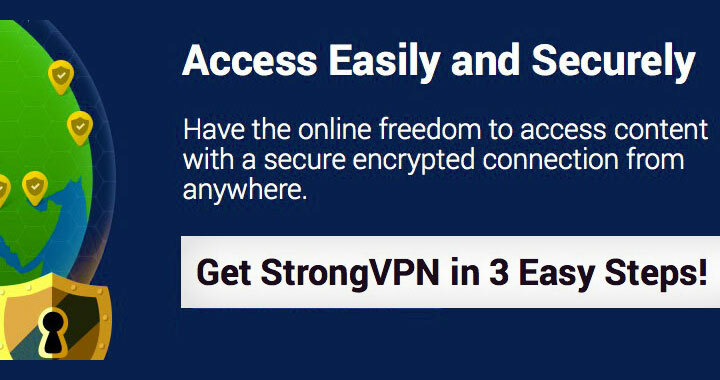 StrongVPN is a private VPN: it doesn’t share your IP address with other users, suitable for all websites. When you need help, you get it fast. Also VPN speed has been impressive. I found it extremely easy to install and use their VPN client software and get connected in a matter of minutes. Works with both desktop and mobile devices, including Windows, Mac, Android, iPhone, etc. Access video & music streaming websites that are restricted by country (Netflix, BBC, Sky Go, Hulu, etc.). Many VPN services are blocked by these sites, with StrongVPN you can simply use all websites undetected. Read below, & get up and going in four steps! Select a VPN package that contains all the country locations that you need. And go through the sign up process as usual. Note: There is a choice between 1 month and 1 year plans. I would take a yearly plan for the best offer. In case there is anything, it’s easy to get a refund because all plans are backed by a 5 day money back guarantee. Immediately after sign up, you will receive an email with the link to download the VPN connection program for Windows or Mac. Install is simple & straight forward. Fill in your e-mail address and the password you setup during registration. Select your desired country from the list of server locations and hit connect! Connected and ready for use. From then on, everything you do online will be fully secured by the VPN connection. With their simple to use app, you can easily get connected with most mobile devices. Search “StrongVPN” on the App Store for iOS devices, or Google Play store for Android devices. And VPN on your phone will be under one press of a button. I hope this guide was helpful. Thank you for reading! Don’t hesitate to ask if you have any questions. Regards, David. Please note: “Cisco Easy VPN” is a Virtual Private Network deployment system for businesses – not suitable for private use. This article is targeted at simplifying every day use of VPN services. Пожалуйста, обратите внимание: «Cisco Easy VPN» – это виртуальная частная сеть, созданная для предприятий, а не для личного пользования. Эта статья рассматривает использование VPN в повседневной жизни. I went through the simple steps and as promised, had the thing running in no time. With previous VPN, Google was constantly asking for the CAPTCHA which was very annoying. I think there were some spammers abusing the same connection. Now with StrongVPN I am not having any of that and connection is very fast. Just wanted to say big thanks for your handy tutorial! J.
Newbies can be quite confused with a lot of providers (targeted at users who don’t mind the learning curve) and truth is that it’s also a business strategy to cut down the running costs by jam packing few IP addresses with lots of users. This will more likely group you together with spammers and the like. That’s just one of the reasons why it’s better to avoid overly cheap services. StrongVPN is still affordable but on the high-end of the VPN spectrum. Great to hear you got it working! Cheers for the feedback. Few questions David – 1. Can you watch BBC iPlayer from abroad with this? 2. Does it support iPad? Thanks! Sure. 1. Yes – you can pass British content restrictions. I went ahead and verified for you that iPlayer works fine. 2. Yes – as all iOS devices are supported, to which iPad belongs to. The app is very convenient and you can have it on all the time, maintaining a secure connection. Thanks for asking! Awesome,I used this again to install it to my aunt’s PC. After the Britain’s mass surveillance bill, VPN is nothing but MUST. Thank you — yeah! On top of that you guys are part of the ‘Five Eyes‘ surveillance alliance; although it’s something that effects all parts of the world.